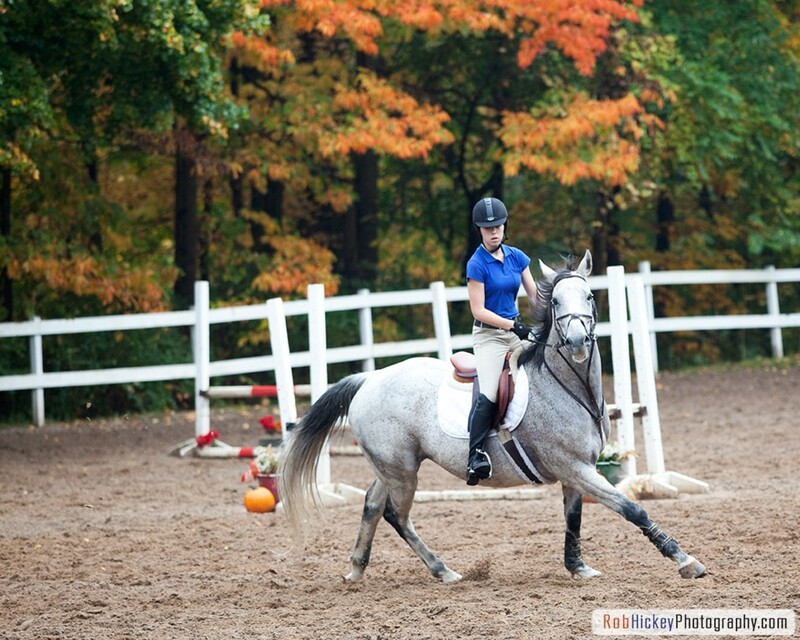 Our lesson program educates riders from beginner through advanced levels of Hunt Seat Riding. The lesson time includes time spent on the ground with the horse which involves pre-ride grooming, tacking and warming up the horse. When the lesson is over, riders are required to un-tack and groom the horse then clean the tack and return it to its proper location. Arriving a half hour before the lesson begins helps the student to be prepared on time. Check the lesson book for the horse you will be riding and begin tacking if you are capable of doing so, otherwise request help from one of the assistants. Lessons are structured for beginners, intermediate and advanced students. Our students continue to move to higher levels and advanced horses. 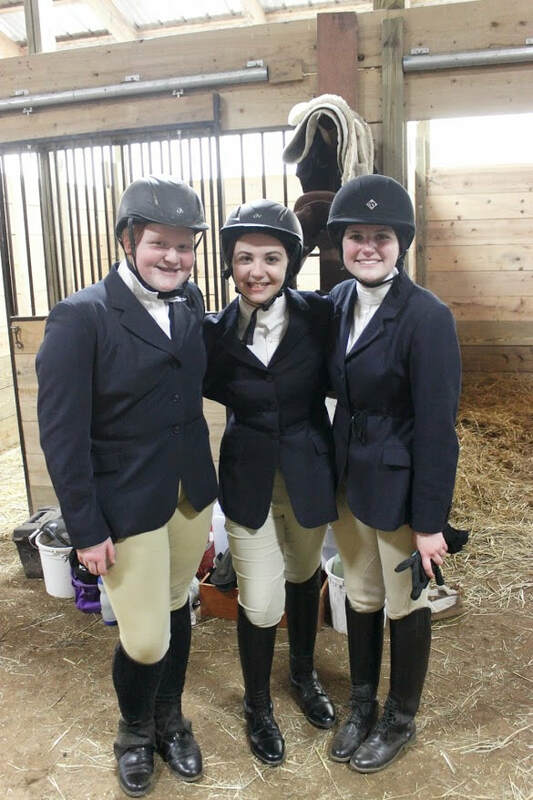 On "the flat" or "over fences", we help students achieve their goals for pleasure or competitive riding. 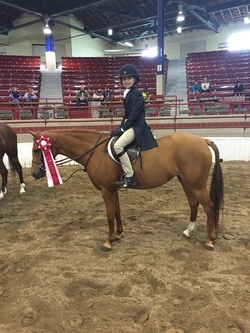 We participate in lesson horse shows and other rated and non-rated horse shows. We encourage parents to watch the lesson. While the student is riding, please refrain from talking to them as the student needs to concentrate on the instructor. On occasion, we post notices and hand out newsletters so it is helpful for the parents to be present to make certain that they are receiving all information. Please ask the instructors any questions you may have. Since group lessons are 40 minutes long, the instructors have extra time to talk with the parents and come into the barn to assist in the care of the horse and student. Group lessons are $150 per month. Payment is due at the beginning of each month for the full month. If you choose to pay weekly, lessons are $40​. If you call and cancel a class, it can be rescheduled within the month, otherwise the lesson is lost. 30 day notice is needed to end enrollment. Group lessons are scheduled for an hour but the mounted lesson is approximately 40 minutes. Your first private lesson is $50 for a half hour class. Your introductory private can be scheduled by e-mailing Heather@HeberleStables.com. After your first lesson, private lessons are $50 for a half hour class, for weekly students. New students are required to take at least one private lesson to be placed into an appropriate group lesson. When placed into a group class, payment is $150 per month, payable at the beginning of each month. Riding is a learned skill and after a few lessons the student will be able to establish a good base for riding and be able to figure out if they enjoy it. Schedule your first lesson time lesson by e-mailing Heather@HeberleStables.com . Students need to wear a light boot that covers the ankle with no more than a half inch heel and jeans. A baseball cap for small children helps in fitting a riding helmet. Safety equipment and ASTM/SEI certified helmets are provided. During the winter months, layers of clothing work best to keep warm. As the lesson progresses, the student will become warm and bulky clothing is difficult to ride in. Leather gloves help to hold the reins in all weather. It is best to wear nicely fitted clothes for safety reasons and so the instructor can see the position of the rider. Please dress suitably for riding. Once you've decided to continue riding, we suggest purchasing your own helmet and other supplies. Make up lessons can be scheduled most days of the week. If your riding level is approved for hacking a horse unsupervised, you may be able to ride on a Friday or Sunday. Riding needs to be done at least once a week to keep up your skills and this is the reason for not carrying over missed lessons. Special circumstances may arise. Unforeseen circumstances may arise in which the instructor cannot teach the lesson. The lesson will be taught by a substitute. A trail ride may be scheduled for some of the lessons. It is still a learning experience. Handling a horse outside the ring and uneven terrain is another learning experience for all riders. The barn is closed on certain holidays. Please check with your instructor or the lesson book.